Club Website teams up with Pro Evolution Soccer! Club Website is pleased to announce a new partnership with Konami Digital Entertainment, the producers of Pro Evolution Soccer (PES 2011), the award winning football video game. We're very excited to be working with Konami. We think they are the perfect fit as a new partner for Club Website because, first and foremost, we know they love football just as much as we do. We're always looking to innovate and push football forward and Konami are no different. Anyone who has played PES over the years will know what we're talking about! We know there are a load of gamers out there amongst our Club Website members and we know you'll be pleased about us teaming up with PES 2011, the choice of the discerning gamer for many years. We've got a whole host of exciting stuff lined up over the next 12 months, so keep your eye on Club Website as there's a lot of fun coming your way. 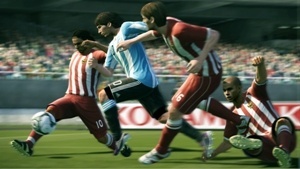 We've had a sneak peak at PES 2011 which hits the shops in the autumn and the first impressions are very exciting. You can take a look at the teaser trailer right now - see below - and we'll be bringing you the inside track on the development of the game and there will be plenty more to come between now and the big launch. We'll even be giving you the chance to play PES 2011 before it hits the shops and, if you're lucky, you could even get to carry out a review of the game for the Club Website public! We'll have a bunch of Konami games to give away when release date comes around and there will be plenty of other great prizes up for grabs, starting right now! To celebrate the launch of this new partnership, we've teamed up with PES 2011 to give away a fantastic prize for any budding young footballer: a place at the famous Manchester United Soccer School! To find out more and get your name in the hat, visit our competitions page right now! So stay tuned - there's plenty to come from Club Website and PES 2011 over the months ahead.